Homepage. 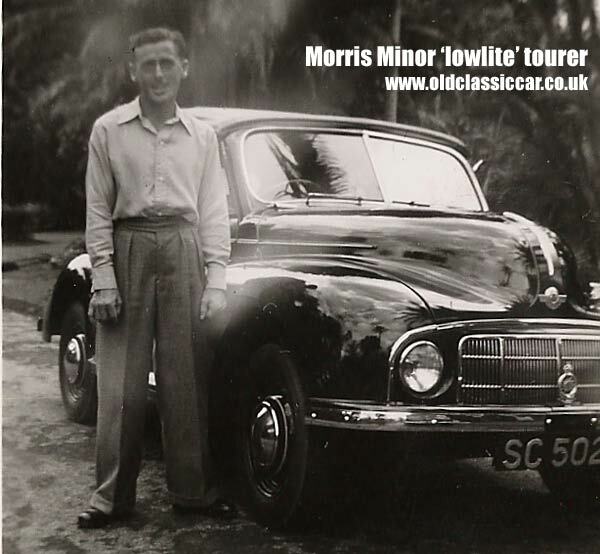 This page: A Lowlight sidevalve Morris Minor MM tourer, possibly photographed in Sri Lanka. This Minor MM photo came in a batch of photos that were taken in Sri Lanka, but whether this Minor was also photographed there I'm not too sure, the style of registration plate isn't quite the same as on British cars of the era, although it is RHD. This lovely black and white photograph shows a gent with his shiny (new?) 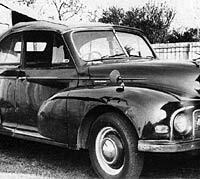 Morris Minor tourer, a very early example of the classic Minor, identifiable by its low-set headlamps, usually known as the 'lowlight'. This one is especially rare as most lowlights were saloons, not tourers. 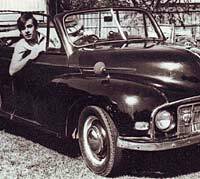 The Minor, or 'Mosquito' as the prototypes were known, was penned by Alec Issigonis, a respected car designer, who would go on to design further legendary cars such as the fwd Mini and 1100. The small plate fitted to the front bumper is a reminder that the Mosquito design was a much narrower car than the final production Minors were. Shortly before full-scale production was due to commence, Issigonis sliced a prototype in half lengthways, moved the two halves apart until he was happy with the look of the new car, and instructed that tooling be made/modified to accomodate this drastic change. By this point, much of the tooling had been put in place for production, including that for the front bumpers. Hence early cars had a 2 piece bumper blade, split, and widened by the use of a blank plate bolted in-between to bridge the gap. Later cars would have a bumper built to the correct width, but all Minors right up to the end of production in 1971 would feature the 4" section in the centre of their bonnet. All MMs were powered by the leisurely 918cc sidevalve engine that had been used in the Series E, which itself dated back to the 8s of the pre-war years. The Series 2 Minor would come along in 1952, and feature the 803cc A Series engine from Austin A30, following the merger of the Nuffield Organisation (Morris) with the Austin Motor Company, resulting in the BMC combine. After I published this page with the tourer photo above, Les sent over this next scan showing an early sidevalve MM Minor saloon, 2 door. As a comparison between the saloon and tourer variants, it made sense to include it here. This looks to me like a period BMC press photo, probably dating to 1948 or 1949, just as production of the Minor was gaining momentum. Shortly afterwards I added an original b/w photo of a later tourer to the gallery, see it on the Series 2 Minor tourer page. 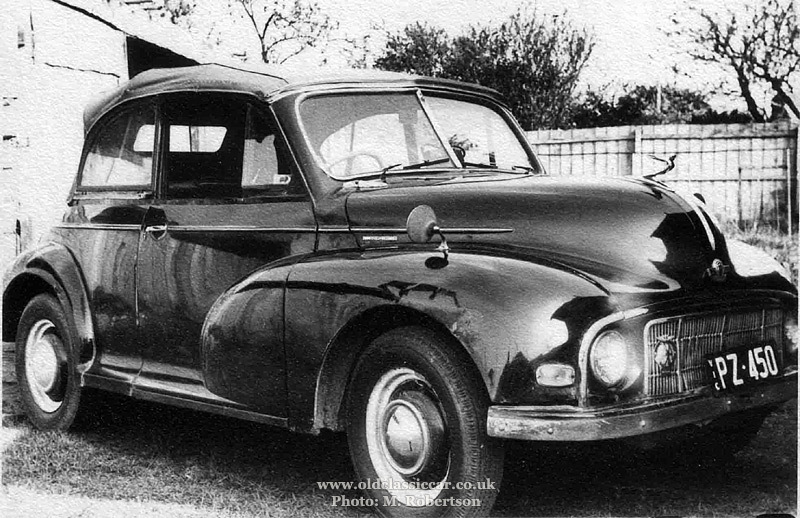 A photo of a "Highlight" Minor MM saloon from 1951, can now be found here. 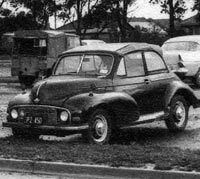 A lowlight MM tourer in Victoria, Australia. 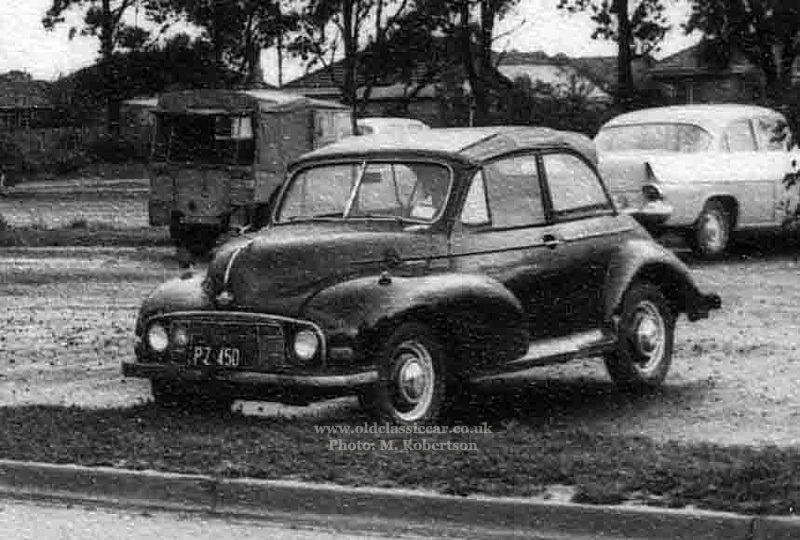 The following photos of a lowlight Morris Minor MM tourer belong to Malcolm Robertson, he owned the car in the mid-1960s over in Victoria, Australia, and wonders whether it survives today? He doesn't have record of its chassis number, just the engine number (USHM2X75593) and its then registration, PZ 450. Does it survive somewhere? If you can shed light on the Minor's history after Malcolm sold it, please drop me a line. The Australian climate can be quite kind to older cars, so it may just be sat in someone's garage or garden somewhere? Thanks for the photos Malcolm. Photo #1 shows its proud owner sat behind the steering wheel of his MM tourer. The shorter bonnet as fitted to lowlights, and early "highlight" Minors, can clearly be seen here, as can the "cheesegrater" grille - which in this instance has received a gentle nudge at some point. Are those Tex wing mirrors? Note the flashing turn signals fitted to this example, the AA badge, and the non-standard bonnet mascot. MMs differed quite significantly from the later Series 2s, not just with the sidevalve engine. The rear axle is different, as are the front brakes, the hubcaps, plus the MM wheels (which don't fit later Minors) are held on with bolts, rather than nuts. I found all this out while recommissioning my own 1952 MM highlight saloon. The second of Malcolm's photos shows the Minor parked up, its hood raised. Note that the MM tourers have removable rear side screens, unlike the fixed windows found on later cars. 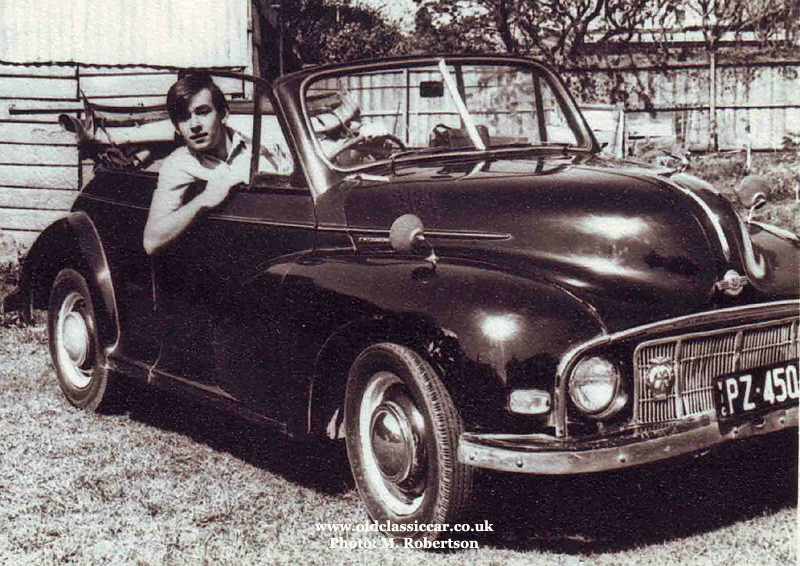 The Minor is in good company, note the Series 1 Land Rover in the background, and a home-grown 1961 Holden. Completing this trio of original photos is a close-in view of the Minor with its hood raised. Return to Motoring Photographs Page 2. 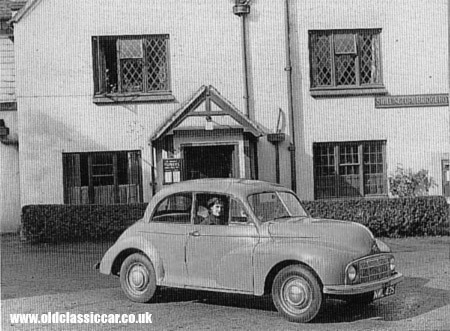 References to classic Morris Minors can be found on pages across OCC. One of the more unusual is for a 1949 children's comic named "Adventure". On its cover are illustrations for a fictional police story, the heroes of which appear to be driving cars that bear more than a passing resemblance to lowlight Minors. 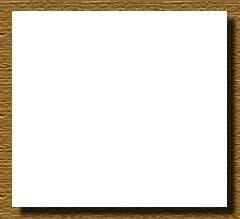 See what you think here.